After a long run that began the day after the John F. Kennedy assassination in 1963, the British science-fiction show Doctor Who went off the air in 1989. In the time between, it scared several generations of children, became a British television institution, and gathered a sizable cult following in the United States. But throughout the ’90s and early ’00s, it seemed like a thing of the past. A 1996 TV movie went nowhere, and an aging fandom had to content itself with novels, radio plays, and other miscellany. That changed in 2005 when Queer As Folk creator Russell T. Davies took over the show and Christopher Eccleston became the ninth actor, within the confines of television, to assume the role of the time-traveling adventurer known only as The Doctor. After one season, Eccleston handed the role over to David Tennant, who enjoyed a long, beloved tenure in the part in an era characterized by Davies’ ability to balance the elements of classic Who with sophisticated storytelling (which rarely forgot it had to entertain children as well as science-fiction fans). Last year saw the end of Davies’ and Tennant’s time on the show, but fans began to breathe easier when Steven Moffat was announced as Davies’ successor. A TV veteran famous for inventing, in his words, the “feel-bad sitcom” with the divorce-themed Joking Apart, Moffat most famously created and wrote the original version of Coupling. He’s also a lifelong Who fan who wrote some of the most acclaimed episodes of the Davies era, including “Blink,” a fixture on any shortlist of the show’s best episodes. Who would assume the part of the Eleventh Doctor was another matter. Speculation drifted from David Morrissey to Paterson Joseph (who would have been the first black Doctor) to, most improbably, Catherine Zeta-Jones before landing on Matt Smith, a name that left most scratching their heads. 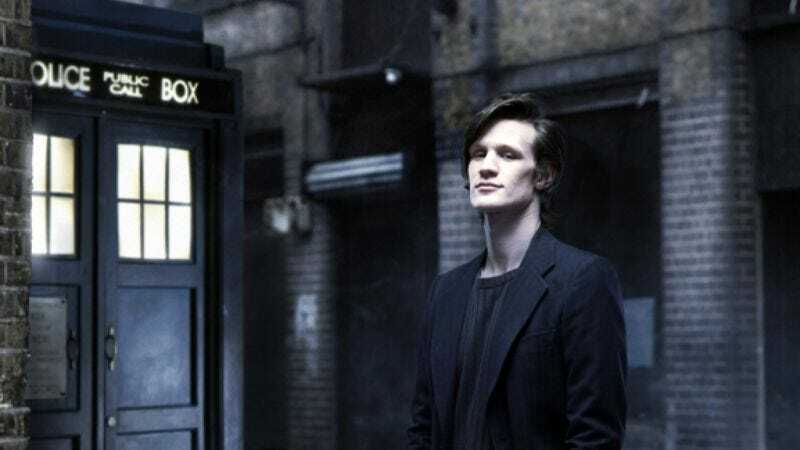 An up-and-coming theater and television actor, Smith is, at 26, the youngest actor to assume the part, but he slips into it like an old hand in the new era’s first episode, “The Eleventh Hour,” which airs Saturday on BBC America. On a trip to New York—Smith’s first—Moffat and Smith spoke to The A.V. Club about the show’s next phase. The A.V. Club: You wrote some of the best-liked episodes in the Russell Davies era. What was it like to go from swooping in to do an episode or two to having to run the entire show? Steven Moffat: It’s a completely different job. Writing individual episodes is still sort of the same job. In that moment, I’m a writer, so I’m doing the same thing. But I also have to look after the other scripts and help out the other writers when they need it. I’ve got to be across every creative decision taken on the show. That doesn’t mean I make every creative decision—sometimes I read articles that make it sound like I make the entire show myself—but I have to be across it all. It’s the most hugely demanding job I’ve ever done or expected to. AVC: Previously when you’ve run series, it’s always been your scripts from first episode to last. What is it like working with other writers on this one? SM: It’s actually quite joyous. They’re all really lovely people. I knew all of them to some degree—it’s quite a small industry. I knew some of them extremely well, which is just fun. We generally have a good time; lots of mad meetings and mad spinning of ideas. So I did enjoy all that. That wasn’t a problem at all. AVC: When you have a show that varies wildly in tone and even in genre from week to week, how do you decide how you balance a season? SM: Above all else, 70 percent of the decision is entirely, “Is this a good story?” If we ended up with two stories that seemed similar next to each other, in the end, if they’re both great stories, we’ll still go with that. Balancing it is easy. Getting good stories is the hard part, and that’s always the priority. I think the people who actually make the decisions spend more time worrying about the balance and the variety and the audience, actually. Really, it’s just about great stories, and that is far and away the hardest, biggest, and most important problem we have to solve. AVC: What makes a great Doctor Who story? SM: The answer is a rather challenging one. The answer is “absolutely everything.” It’s a show that attempts to entertain by every means possible. We try to be across every genre and every style in any given episode. It’s like trying to press every button at once. There’s a bit of funny and silly and frightening and serious and moving and ridiculous, all at the same time, which is what gives it its extraordinary flavor and its incredible longevity. It has not only that variety and width across the episodes, but it has them within the episodes, too. So a great Doctor Who story just has to supply all of that at once. That sounds like a terrifying answer, but that’s the truth. You really are looking for a very high level of invention and energy. AVC: Who shoulders more of the burden in making sure the show stays true to the Doctor Who that has come before: the people writing the script, or the person playing The Doctor? SM: I suppose it’s me. But I have to say, that’s not a problem that ever really comes up. First of all, it’s so hardwired into my brain after working on it for so long and having loved the show for so long. I don’t have difficulty in knowing what’s right and proper for Doctor Who. Also, it’s a broad show, Doctor Who. It can take an awful lot of variety. AVC: What’s the first episode you saw as a child? SM: I’m informed, but I have no ability to remember, I did actually watch the first one. I must have been just under the age of 2, so I wouldn’t remember it very well. [Laughs.] The first one I remember watching was the very first one or second one that Patrick Troughton was in, but I know that wasn’t the first one I saw, because I was confused about where Doctor Who had gone. I kept asking my dad, “Where’s Doctor Who?” And he said, “Well, the man with the black hair is Doctor Who,” and I was very, very confused. So I must have been a regular viewer up until that point. But in very early childhood, you don’t remember that well. AVC: You saw the show go into decline and go off the air. Did you ever have in the back of your mind that you’d get a chance to help revive it? SM: It was always a fanciful thing I’d love to do. I got started in television in 1987, ’88, just as the show was going off the air, and I remember actually thinking—I had a big name in children’s television for a while, and I thought, “Oh, maybe I’ll get a shot at doing Doctor Who.” And they more or less axed it that day. It was like I had waited 26 years and missed by an afternoon. AVC: As someone associated with the Davies era, how do you go about making this era of the show your own? SM: Again, that’s not something I think about. I don’t think, “How am I going to stamp ‘me’ all over this show?” Who the hell cares about that? People want to tune in and see the most exciting series they’ve ever seen. They want to see Doctor Who; they want to see monsters and fun and adventure. It happens automatically. It’s not something you think about. I think that the series we’ve got probably is quite distinct in tone from the previous one, but it’s not something I’ve ever given a second thought to. It’s automatic. It just happens. My priorities are where they should be, which is making really great, really exciting television. AVC: That said, in every new era, including this one, there’s sort of a reinvention of every element, from The Doctor to the interior of the TARDIS to the sonic screwdriver. SM: Yeah, we had to. As I arrived, the entire regular cast was leaving. It just made sense to go for a clean slate. That’s not, within the history of Doctor Who, such a radical decision. One of the great things about Doctor Who, as with James Bond, as with Sherlock Holmes, I suppose, is that occasionally they just do a clean slate. You change everything, and yet you change nothing. It’s the same show made of different bits. AVC: Others have noted that there’s an autobiographical element to your sitcom work. Is there anything autobiographical about your work on Doctor Who? SM: I certainly hope not! Not really. When I was writing—there’s always bits and pieces of your life leaking. But Doctor Who is such a wild fantasy, it would be hard to use many of the details of an ordinary middle-aged writer’s life to inform that. But I suppose things creep in. I have to say, I’ve noticed that I’m missing comedy a bit. I’m tending to write a lot of very funny e-mails. I’ve got this column I write for Doctor Who Magazine, and I always write it very humorously. I think I’m just missing that side of writing a bit. AVC: You’ve brought in some writers known for comedy, though, to fill out the writing staff this season. Was that a conscious choice? SM: Again, not at all. Maybe because Mark Gatiss, Richard Curtis, and Simon Nye are all well-known comedy writers. They’re not coming in to do comedy episodes. Those guys are just bloody good writers, and you’re lucky to get them. That’s the truth. I know this is going to sound very self-serving, and I apologize for it, but if you can write comedy, you can pretty much write anything, because it’s the hardest. It’s the most technically demanding, the most precisely evaluated form of writing. People know if it works or not. There’s a big button marked “fail,” and that’s when nobody laughs. I think training in comedy, as it were, a history writing comedy, is a powerful tool for anyone. But no, it’s entirely accidental. These are all wildly experienced television writers, which is a must for Doctor Who. This is not the show for rookies. You really need to know your stuff. SM: I don’t think I’ve ever been involved in anything that is so technically demanding at every level. You have to be a world-builder; by that, I mean you have to create a whole world of people, whether it’s a different planet or even just this planet. You’ve only got two regular cast members. The precinct is the entirety of space and time, so you have to set up this whole world of characters that The Doctor meets. You’re not just inheriting a bunch of people and learning how to write for them as you would in a soap. You’re creating a whole bunch of characters for a one-and-only outing on television, because the ambition of Doctor Who is massive. It’s adventure and action and sci-fi and all those things that demand you have ambition and a sufficient knowledge of the realities of television to know how it can be realistically realized. You have to know that we don’t have Avatar’s budget. You’ve got to be smart enough to set it down on the page in a way that a film crew could handle, that a production team could actually make it. That requires loads of experience. And there just aren’t, especially in Britain, that many action writers and adventure writers. We’ve got drama writers, but people who can actually write proper action-adventure are few and far between. AVC: It must be overwhelming, also, to know that you make choices in the writing that will start people building special effects that you can’t take back. If you decide on a three-eyed alien, you’re kind of stuck with that. SM: Well, you’re never stuck with anything. I have had to rewrite aliens to be equally exciting, but not as expensive. I’ve played the invisibility card more than once. [Laughs.] You have to be flexible on everything until the very last second on this show, because we are on a knife-edge with our budget. I think the equivalent American show would just fall over laughing if they saw how much money we make this show for. We just have to be creative to the last second. AVC: “The Eleventh Hour” gives the impression that you have a larger budget than the previous series. Is that incorrect? SM: That’s incorrect. [Laughs.] We certainly do not have a larger budget, no. No. AVC: This is a quote from you about The Doctor’s companions: “The Doctor may long, he may notice, but he doesn’t do.” If that’s an ironclad rule and viewers know it, how much can you tease them without frustrating them? SM: It’s not an ironclad rule. Nothing can ever be a rule in drama, because then you’re saying certain things won’t ever happen, and that would be very boring. It, generally speaking, is true. The Doctor doesn’t seem to go that extra mile with any of the women he falls for—and he does fall for them, and always has—he just doesn’t do that. He seems to draw back from that. To play the more fatherly, the older-brother figure, or just the almost boyfriend but not quite. It’s quite interesting with The Doctor and Rose. He was quite clearly nuts for her, but just didn’t quite do that. That’s something he decided against. AVC: Do you have, in your head if not in the show’s canon, a reason why? SM: In my head, not within the series: I think it’s quite important that we never quite know what The Doctor thinks. He’s a mysterious guy. If we start reducing, we lose some of that. But in my head, he knows he’s leaving. He’s in love with that big blue box. He wants to run away and explore the universe far more than he wants to settle down with anybody. So if you’ve got your bags packed at your feet from the moment you arrive, you know you’re not in the business of making a commitment. AVC: If I did my math right, you’re of the generation that didn’t really have Doctor Who growing up. Is that correct? MS: Your math is completely perfect. I was part of the barren age that didn’t have the show, because they were foolish and they took it off the air, the silly old beans. Yeah, man, that’s exactly it. So I didn’t really watch it as a kid. I was aware of it, because you are in England. It’s really part of your cultural fabric over there. You’re born knowing about Doctor Who, and you know what the TARDIS is, and you know what a Dalek is and all that. But it wasn’t on the TV, which is a shame, because now I meet 8- and 9-year-olds, and I see how much they love it, and I wish I had that experience a little bit. But I get to be The Doctor now, so that’s payoff. AVC: What was your first encounter with the series, then? MS: I was aware of it. I had seen it on the TV every now and again. But it was sort of my audition. I got this script for it, and I was like, “Wow, this is the best thing I’ve read in ages, and this guy is the best character I’ve seen in ages. He’s the cleverest man in the universe. He has that courage, wit, bravery, but he’s also incredibly fallible, so it’s incredible. On getting the job, I went back and watched all of the current revival, from Christopher [Eccleston] through David [Tennant], and then went back and watched some Tom Baker and Patrick Troughton. AVC: The audition process was apparently three weeks long. What was that like? MS: It was relatively simple, to be honest. There were two auditions, and they happened in hotels, because they want to keep it a secret and stuff. But it was like any other audition, you know? You try and learn the lines; you try and be as brave and creative as you can. You go in and you do your bit. That’s what I did, and here I am today. It’s sort of remarkable, really. AVC: How much has your interpretation of the character changed from the time of the audition to filming the first appearance? MS: Hugely. Absolutely massively. Hopefully there were elements of the same man in there, but obviously whatever my instincts were were correct. But I think the way I articulate them, I’ve probably just become more assured and more in control of the language as well. The language in Doctor Who is mad. And he says a lot of it. That’s one of the great practical challenges, just learning the lines, because there are so many in each and every scene. I think I’ve probably just become more assured and in control as the series has gone on, which hopefully makes sense narratively for my Doctor, as well. He sort of starts off a bit like a newborn lamb. AVC: You’re destined to be compared to David Tennant. How conscious are you of avoiding any sort of tics or recognizable influences from Tennant’s performance? MS: Well, it’s not something I’ve ever—I would obviously never imitate, but it’s not something I’ve consciously tried to avoid or recreate. I play the truth as I see it. I guess that’s for other people to decide, because I just do it my way, and that’s the only way I will ever do it. AVC: When did you realize that you understood the character, and that this was a part you could play? MS: I’d probably be lying if I said it was in the first day of the first week. I was probably just going, “Wow, what the hell is going on?” But part of the battle of the first month is not understanding quite where you are, and seeing these great cultural icons like Daleks and TARDIS in front of you is part of understanding, here he is. He’s battling through that and summoning your courage. I suppose there’s not one particular, definitive moment I can give you when I said, “It was in this scene on this day.” Whatever it is, whatever I’ve put out there, whatever I’ve done, it all has to be… From the first day, I have to say I understood it then. Because I was there. I was doing it. And that’s the only way that it can be. But I guess two weeks in, I felt more comfortable than I did on the first day. Four weeks in, I felt more comfortable than I did two weeks in. From then on, it’s your home, and you’re playing with it, and you’ve got this wonderful part. But there wasn’t one definitive moment.